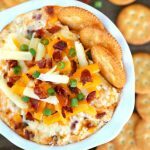 Are you looking for a great dip to make at your next get together? Well, you’ve come to the right place because this Warm and Cheesy Bacon Ranch Dip is AMAZING. This dip is also known as Crack Dip because you won’t be able to stop eating it. Add all ingredients and cook on low for at least 3 hours. Mix after the first hour and continue to mix every 30-45 minutes. Preheat oven to 400 degrees. Spray 8×8 baking dish with cooking spray. Bake for 25-30 minutes or until hot and bubbly. Serve with chips, crackers, and/or veggies.